The Section Clinical Tropical Medicine provides consultation regarding accidents caused by venomous and poisonous animals. In Europe, this is a task fulfilled by both toxicology information centres and tropical institutes. Our section is one of the few European institutions to maintain this expert knowledge and research into this field. Thomas Junghanss has been assigned the specialist patronage of the Swiss antivenin network ("Antivenin-CH") established in 2004. Accidents caused by venomous and poisonous animals are among the most underestimated and most neglected health problems worldwide (termed "neglected diseases"). 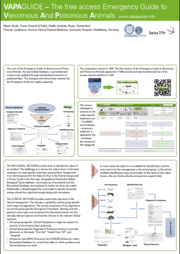 The digital version of the VAPAGuide (Venomous And Poisonous Animals Guide) freely accessible on the Internet enables physicians and biologists worldwide to identfy animal groups and follow the emergency and clinical flowcharts for diagnosis and treatment. It is a rich source on biological and clinical data in the field of toxicology. 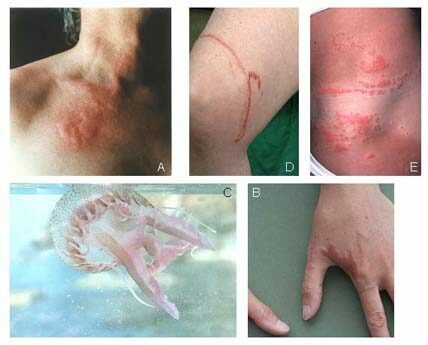 Jellyfish sting marks: Jellyfish bell marks (A); tentacle marks flared up about 2 weeks after initial contact (B); Pelagia noctiluca in the Mediterranean Sea (C); tentacle marks of a Physalia physalis (Portuguese man-of-war) in the Atlantic Ocean (D); Linuche unguiculata (Seabather's eruption) (E).